Goats! For goat lovers and owners, they’re truly the greatest of all time. And if you need to buy gifts for a goat lover or owner, something related to their favorite animal is perfect. Whether you want a practical gift or something fun and creative, this article has tons of perfect gift ideas. 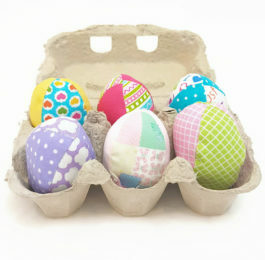 These are great for Birthdays, Christmas, anniversaries, and any other gift-giving occasions. If you have a loved one who is obsessed with goats, then you know this applies to them! 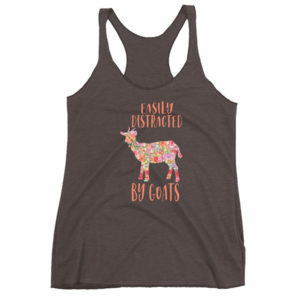 Design by Orylin Apparel, this tank says “Easily Distracted by Goats” and features a fun illustration of a floral goat. This is a great gift idea for goat lovers and owners and the racerback tank is perfect to wear to the gym or around the house. Since each order is custom printed, you get a choice of seven different tank top colors and five different women’s sizes. This is perfect if you’re looking for gifts for goat owners. Made by Etsy seller Cowboy Brand Furniture, this sign says “Money can’t buy happiness, but it can buy goats, which is pretty much the same thing.” This sign is handmade on pine wood and comes with a grass rope hanger for a nice rustic look. This sign is perfect to hang in the barn or in the house. Now here’s a gift that’s fun and practical. These cute and cozy socks from Socksmith are embroidered with a variety of goats on the sides. They’re subtly fun and the gray color means you can easily wear them to the office or more formal occasions and then surprise everyone with your whimsical secret. Fits women with shoe size 6-10. 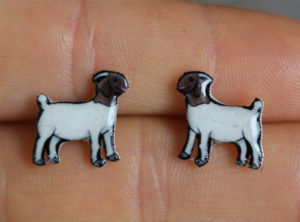 If you’re looking for jewelry gifts for goat lovers, these handmade earrings are perfect. Salt of the Art draws illustrations of animals and turns them into gorgeous earrings. This set is a pair of Boer Goats and they’re absolutely adorable. They feature stainless steel posts which are hypoallergenic. There’s always a good reason to use a tote bag: whether it’s for grocery shopping or carting books to class. For goat fans, this tote bag is absolutely perfect. Made from natural cotton canvas, it says “Totes M’Goats” with the image of a goat. The tote bag is great if you want to put together a goat-themed gift bag–just fill it will other small gifts from this list and a few of the giftee’s favorite treats. Screen printed in the USA. Measures 11″ x 14″ x 5″. Perfect for chilly weather, this is a goat gift everyone can appreciate. 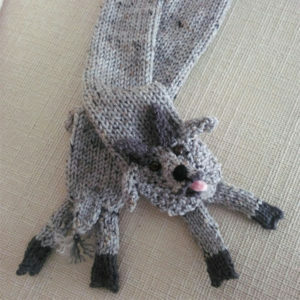 This goat scarf is hand knitted by Jack the Man About Town. It’s designed to look like a goat, with the head and front legs on one end, a looooooong stomach, and then the rear legs and tail at the other end. The face features hard bead eyes, knitted horns, and even a cute pink tongue. This is a great gift for a child or a playful adult who loves goats. Available in three sizes: small, medium, and large. Goat ownership isn’t an option for all goat lovers. But this gift is a nice alternative. Patrick is a 19″ stuffed animal made to look like a pygmy goat from Cameeroon in Africa. This stuffed animal is extremely lifelike and well made to be displayed, played with, or cuddled. This stuffed goat is fun for adults and kids alike. For ages 3 and up. Looking for a cute little gift for your favorite goat lover? Xylographilia makes specially designed enamel pins. This one features a black goat standing on his hind legs. 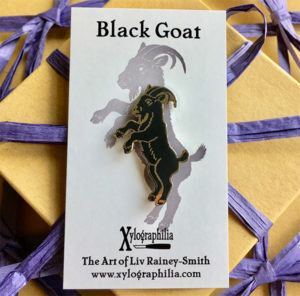 The pin is made with a nickel free finish and has two pin posts on the back to securely attach this goat to any jacket or bag. Your order comes with a gift box, so it’s ready to gift as soon as you receive it. This tiny gift makes a fantastic stocking stuffer. It’s also great to include in a gift bag. This family-friendly card game is perfect for all goat fans. The goal is to become the Lord of Goats by gathering the biggest herd of goats. Stack identical pairs of goats to grow your herd and play action cards to get magical goat powers. As you can see, goat lovers will absolutely LOVE this game. 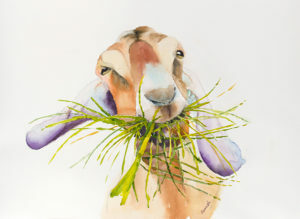 Annette Bennet is an artist who makes a variety of gorgeous watercolor paintings of nature and animals, including plenty of goats! Her gorgeous original art is available as prints or various sizes and even on wrapped canvas. These goat paintings are perfect to display at home or in an office. 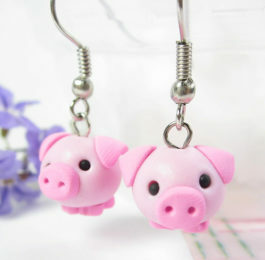 Looking for more animal themed gift ideas? 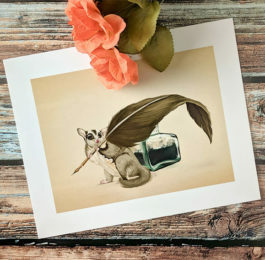 Check out more gifts for animal lovers.